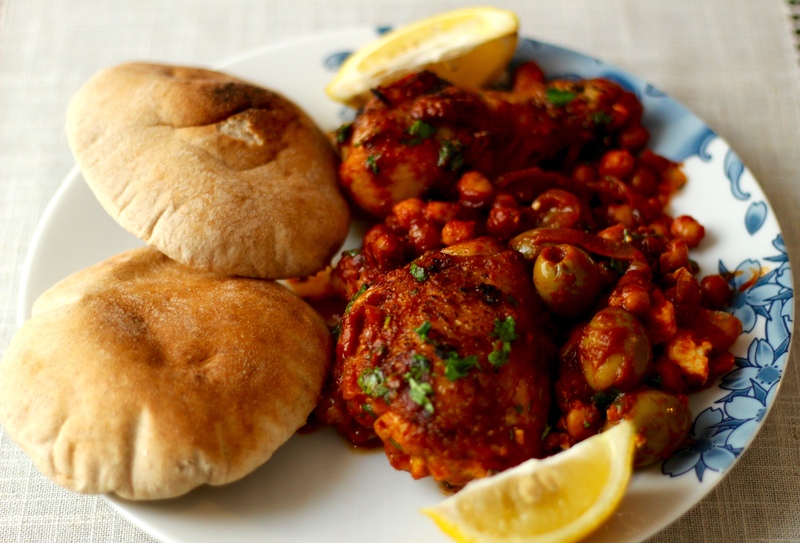 The best part of creating these recipes is sharing the food and experiences with friends. From the last Meatball-off one of my guests set up a challenge for me. He created a list of parameters I had to stick to for the next dish. His pallet wasn’t keen on a couple of things, no onions, nothing spicy and no pepper. Three things which I love. Something else which stood out for me of his likes and dislikes was his dislike of tomatoes except as a Marinara sauce, or in other cooked forms. This is a complaint I hear often, it usually has to do with eating mass-produced out of season tomatoes versus buying them in season locally grown. Out of season vegetables don’t have the same values in vitamins, flavor, or natural color. Tomatoes show these sins the most often being flavorless with a mealy texture. During winter times I like to use homemade summer bottled/canned tomatoes, but I don’t always have them on hand. It is now early spring and we can start to find good vine ripened tomatoes in the stores. Be sure to smell them before you buy them. The ones with the stronger smells have the best flavor. Organic tomatoes have the best texture and flavor. Baking also helps bring out the flavors of the tomatoes and they go amazingly well with yellow squash. 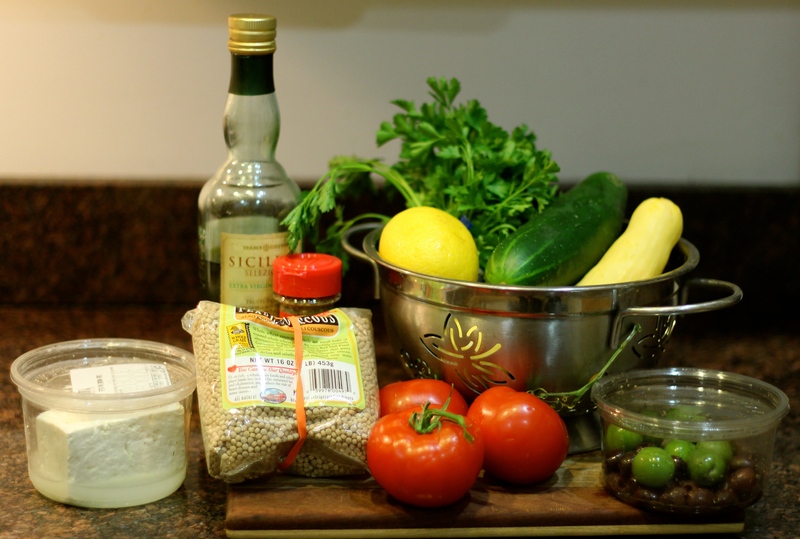 My inspiration for creating a mediterranean meal came from my memory of an onion free couscous salad I created years ago for a client, who needed an alternative grain. My original recipe used mint instead of parsley. 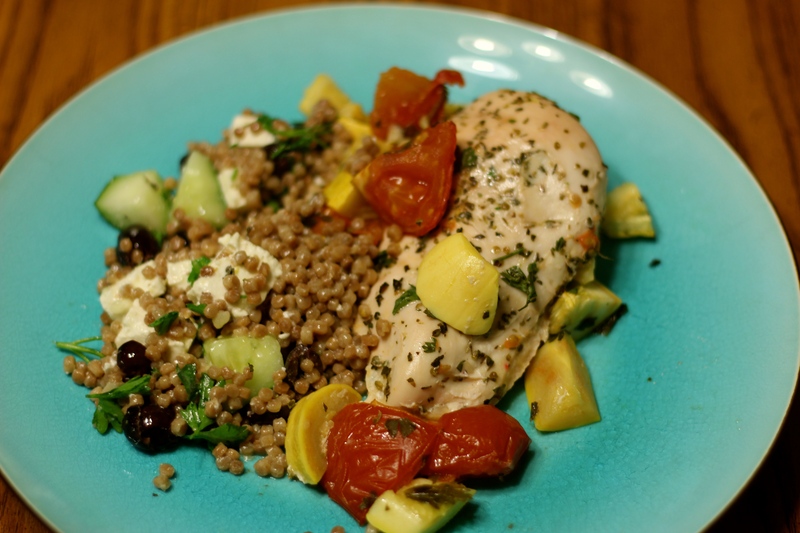 The change makes for a perfect bite when combined with the roasted chicken with yellow squash and tomatoes bringing out the best flavors in both dishes. Tip: If you make this salad to stand on its own, substitute mint for the parsley. Pre-heat oven to 425°. Pat chicken dry and season with 3/4 salt. 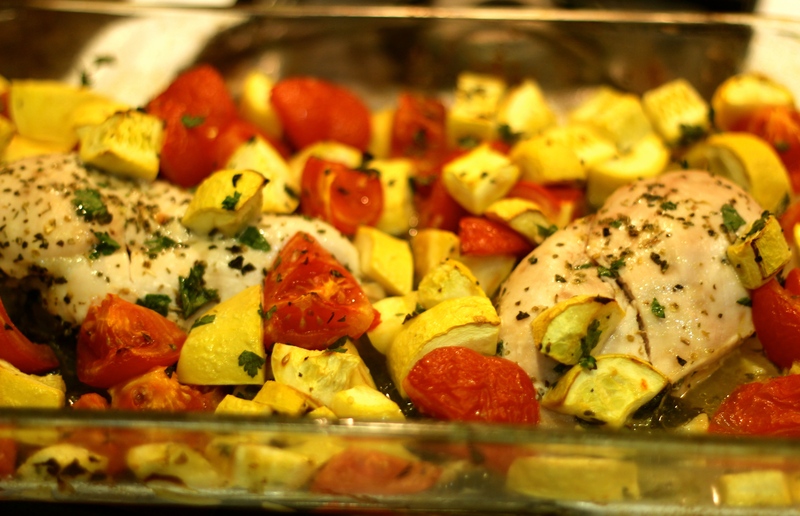 In a large baking dish place chicken breast, yellow squash, Tomatoes, garlic, oregano, parsley and olive oil. Mix by hand so everything is evenly coated and distributed. Cook in oven for 20 minutes. Add white wine, baste and cook for another 20 minutes or until chicken is cooked through. 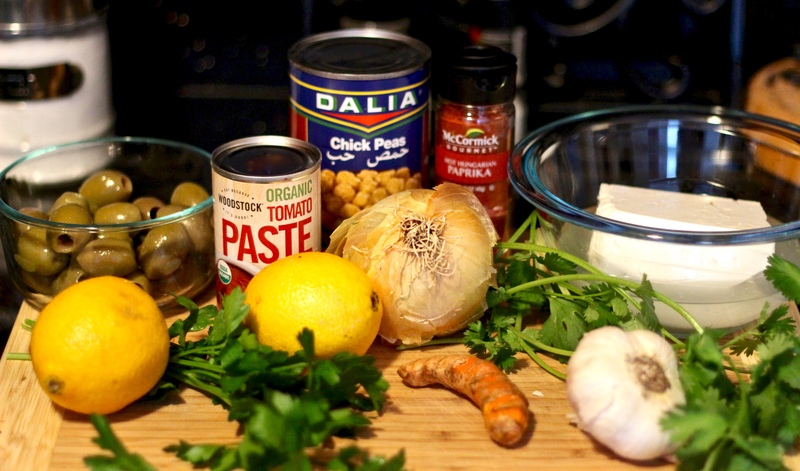 In a 2- to 3-quart wide heavy saucepan over moderate heat, pour in 1 tablespoon of olive oil and cook garlic and couscous stirring frequently, until the couscous and garlic appear slightly golden, 1 to 2 minutes. Add water and salt bring to a boil. Cover and lower heat to a simmer for 10 minutes. 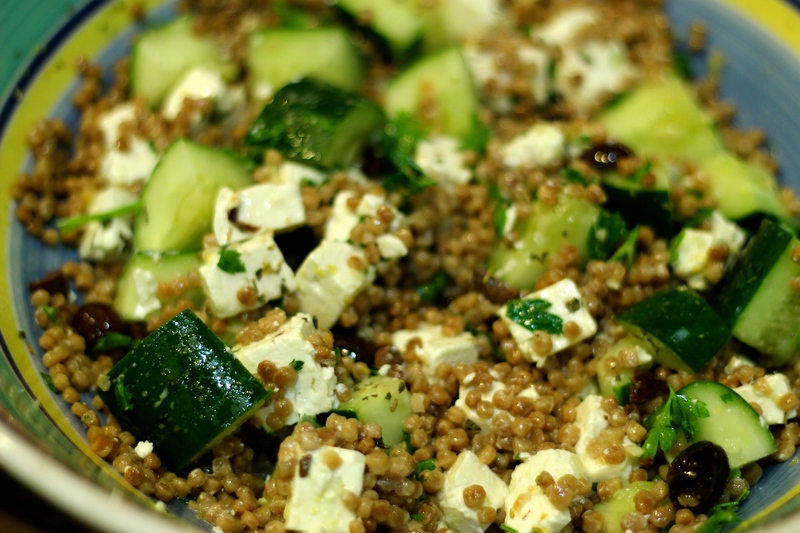 In a medium-sized bowl add all the feta, cucumbers, parsley and olives. Grate the lemon rind over the salad. Be sure not to grate the white part of the rind. Add the juice from the lemon. Then add the last 2 tablespoons of olive oil. Mix well and serve. Tip: The salad can be made ahead and stored in the refrigerator until ready to serve.